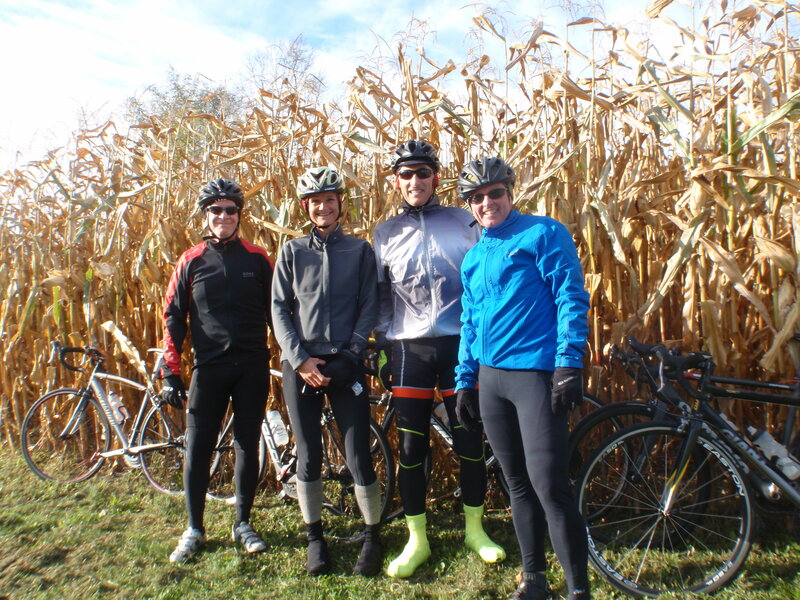 Oct 03/15: 73 Kms; 2 Hrs 28; 409 Metres; Seven Riders. Well, wild and wonderful it was; gnarly winds to boot; and cool, cool air it but couldn’t compete with our let’s-go attitude, as we rode hard into the nor’easter. It was difficult at best but we rode undiminished in spirit, and with some hilarity. You just should have been there to enjoy the magic dance of bikes and their shadows as each bobbed and weaved in unison to the buffeting cross-wind as we rode County Road 5 to Fitzroy. But, nothing compared to the silent air around our ears as we travelled south-west on Galetta Side Road for Dwyer Hill. Pure delight it was. Yes, you just should have been there. And, you can tomorrow when we will ride again. Meet at Stinson on White Lake Road at 8am 8am and ride to Almonte via Conc 10, Pakenham, Hwy 29, Clayton Rd, Conc 8, etc. for coffee at Palms; home via Martin St, Blakeney, Dwyer Hill for a total distance of 70- 75 kms max. This will be another short ride but the outward leg will be tough because of the E wind; however, we will have fun on the homeward leg, mostly. Don’t miss it! The weather forecast is calling for cloudy skies and temperature in the single digits (3 – 8 C); winds E at 15+. Dress for the weather. Information about to-day’s ride for new and old, these are ‘no-drop’ group rides. It’s steady as she goes (conversational style) and easy on the legs. If you have had thoughts of joining us and weren’t sure about the pace or the distance, then, here’s your chance. You’ll love it. We all do. Just a reminder to subscribers that you will get an email alert of any last-minute notifications by 7am on ride-mornings. For non-subscribers, please check this blog before leaving home.